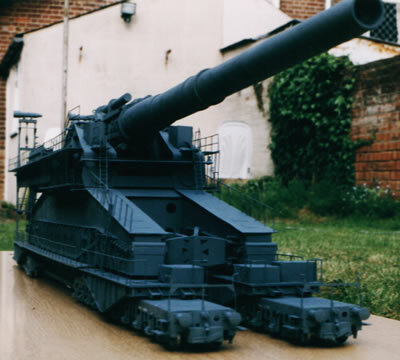 When I recently built a model of the German rail gun Dora in 1/35 scale for a friend and customer, we had already been toying with the idea of the same model in 1/16 scale,this was to be the last rail gun and then we could move on to other projects,well we have all heard that before…..we’ll see. 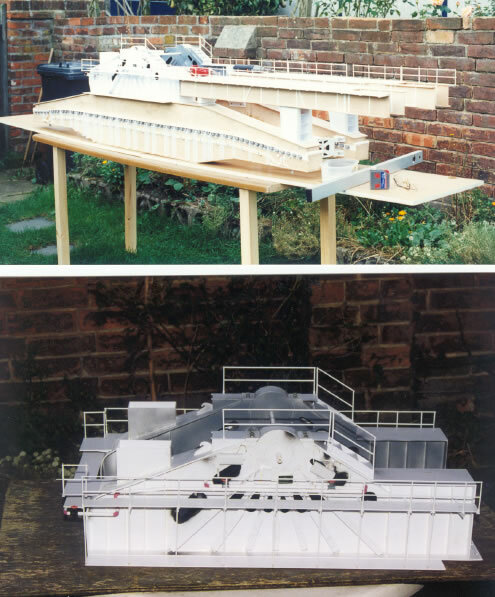 The customer (Peter) wanted to be more involved with this new model and eventually finished up making all the big components,the two main gun carraiges,two rear ammo truck carraiges,eight rail truck tops,four bolster tops,eighty wheels assembled on thick brass tube axles and the breech unit. The barrel was again turned by a local wood turner, I was wondering if I had anything to do. My part of the work was started as before with 16 inner truck drops from 60th card these were fitted to slots provided in the tops and then 16 outer drops were made from 30th card, these outer pieces were shaped as per the plan. The inner drops had elongated holes to allow for some movement, the axle/wheel assemblies were dropped into the inner slots and a piece of 1/4x80th strip added to the bottom of each to hold them in place. A master of the axle box was made from 60th card and thin strip,the damper units were made with fuse wire wrapped around 3/16 tube with a top strip added,these were sent off to have 80 of each cast in resin. The wheels that run the length of the body to assemble the carraiges ,again started as a master made from a brass curtain ring with centre spokes from 20th strip and a 2mm hexagon bolt head in the middle,these were then cast this time in white metal (280 in total). I wont go into details of allthe parts as much is the same as the 1/35 model,but some things may be of interest, for example because of the scale the large nuts that run down the sides of the axle boxes had to be a bit better than just pieces of rod, and I found that Perkins who supply all Evergreen products also have hexhagonal rod in 2,3,4and5mm thicknesses and it’s very good. I used the 3mm cut into slices and fitted in all the required places and to these slices of 3/64 rod for the protruding bolt end.This was a time consuming job but I was pleased with the results,I then followed the same idea for the smaller and fewer nuts at the bottom. When the resin parts were delivered the trucks were assembled and the extra parts the buffers are large felt tip pen bodies (what we do without them) and 1/2″ tube with 60th discs,the side steps are balsa pieces fitted to 1/8″x60th brackets most other parts are simply a bigger version of the 1/35 scale model. The extra parts fitted to these trucks that should have been on the smaller ones(OOPS) are the rollers each side of the top middles, I made them from pieces of 3/8 tube and shaped pieces of 60th card. The hooks are from 80th card and shackle assemblies from 80th,1/16 rod and 3/16square tube. The handles along the side of the trucks are 3/16angle and 1/16rod,the motor extentions on the front of the four trucks are from various card and parts from the bits box., the eight trucks were then set aside to dry, although there would still be a lot of small details to add at a later stage. The next job to be done was the coupling doors to join the two main carraiges together these were made as with the 1/35 scale model,but with more detail being added as I went along, the extention fitting arms are from 3/8 square tube, 5/8x80th strip added to the top and bottom to give a girder like appearance, the remainder was then as before. He He…big? you bet! Brackets were made from laminates of card to 1/8 thick and shaped into pairs the bolt heads were added and the eight sets were fixed to the inside of the carraiges,the single brackets were then made and added at the set distance behind the others to take the ends of the tubes. The four bolsters to take the whole main assemblies had been made previously and all that was needed was the handrails from 3/32 tube around the fronts of each one and five tool boxes for the tops made from 60th card ,the front two bolsters also have pairs of steps which are from 60 &40th card, the netting halfway along the length is from an old piece of curtain (keep everything!). 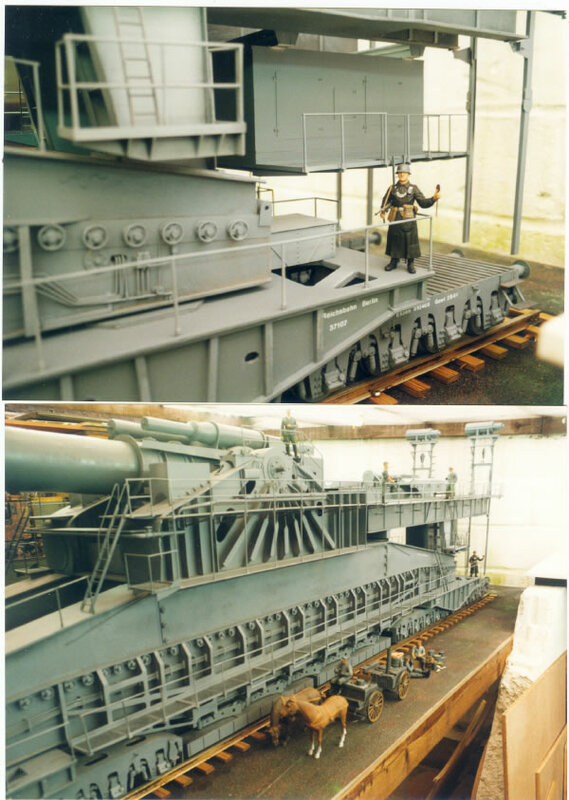 The upper or trunnion carraiges were first cut as four identical side pieces from 60th card and these were then fixed to another piece for the base, when the space had been worked out all the shaped openings were removed and the sides refitted with spacers of card.The side ribs were cut from 60th card and faced with 3/8×80 strip, at the tops of the ribs a plastic disc was added and fitted with 3mm hex bolt heads, all the detail parts were then added from card and strip in the same way as the smaller model. The valves and elbows for all the tubing are ready made items from the plastruct range. The next thing I made, but to be fitted later were the two top walkways for the upper carraige,these are from 60th card and the brackets shaped from 40th card. These are fitted at certain intervals along the length and protrude slightly, on the ends I fitted pieces of 5/32 tube to eventually take the handrail uprights, the inside of the walls had pieces of card fitted to take a couple of crossmembers to allow a place for the barrel rest at the end,all the final parts & details were then added. The main carraiges as I mentioned earlier were built by the customer, and a good job he did on them too, the basic units are from 12mm ply with 3mm ply added to the tops and bottoms,this was all pinned & glued. I made the side ribs from 60th card copied from cardboard templates, these were glued to the main bodies along the full length of the outsides, but to the ends only inside. I next added a piece of 5/8x80th strip to the lip just above the ribs & apiece of the same above that at right angles. The handwheels for the sides were produced in white metal from a made up master. 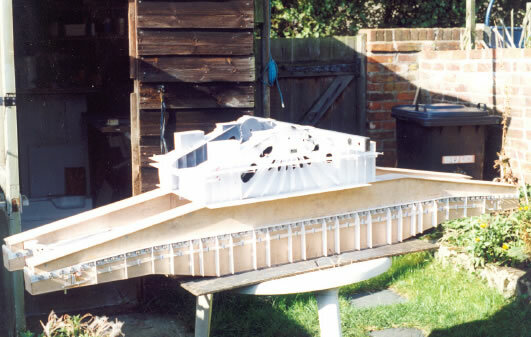 Seventy were fitted to each outside & 16 to each inside, front & rear, I then fitted brackets from 1/4x80th strip between each rib,onto these were fitted lengths of 1/16 rod in groups of four running through each rib and going into oval shaped holes at the carraige ends, at this point the other various details were added copying the photos. I then added the tread plate to the tops of the front ends using ready availible plastic sheet from the slaters range, I then fitted the handrails to both ends from 5/32 bases & 3/32 uprights. 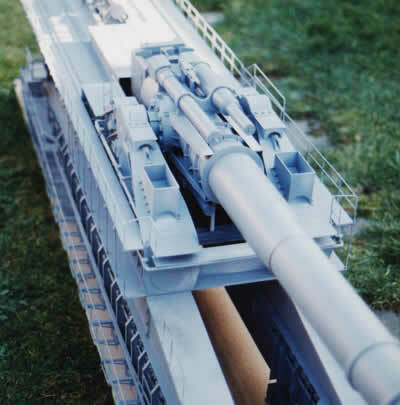 The rear extentions for taking the ammo trucks were also ready made from plywood & to these I added the side walkways from 60th card again fitted with handrails at set intervals, a set of lines was fitted to the top of each & brackets at the rear tops for two support bars when the lifts were made. The stabilizing floats that run each carraige middle were the next job to do, first a cardboard template was made to the shape of the float arms and then transferred to 30th plastic card cutting 40 pieces in all these were then drilled with three different size holes and glued into sets using1/4x80th strips at one end and 1/2 inch channel at the other, pieces of tube 7/16 down to 1/4 inch were put together 3/4 of an inch in length with a disc at the top and in the middle was fitted shock absorbers from 3/16 and 1/8 tube. The main rectangle stabilizer bases are from 60th card, and onto these are fitted squares of 40th card at set intervals, two of the bases have three arms fitted and the other two have two each. Pieces of 60th card were then laminated to a 1/4 inch thick to serve as mounts for the arm assemblies, all the arms were then fitted as in and out and left and right. 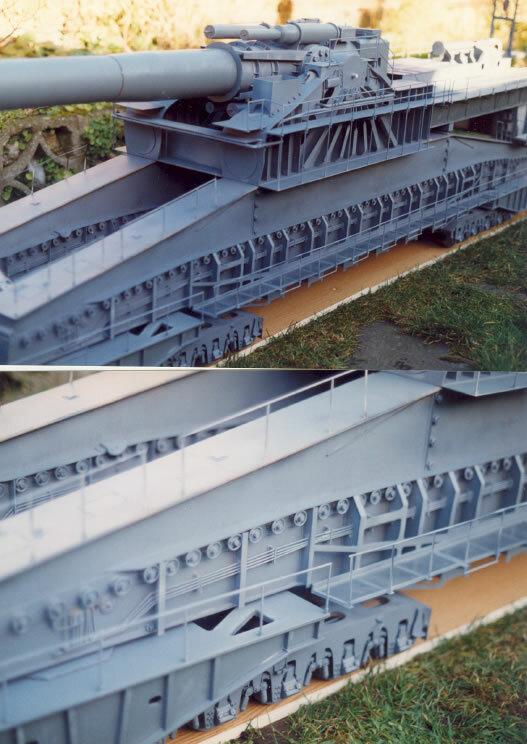 The rear ammunition lift bases were made from 60th card with 1/8x60th strip edging and following the photos and drawings the side uprights were made from 40th card shaped and fitted to main arms of 7/16 I beam section, these extend up to a top flat stage which mount the motors, below the lift bases I fitted four lengths of 7/16 channel which go down almost to the truck tops.The motors were made from 48mm and 25mm tube with some detail strips added and fixed to the top platforms. Steps running up the outside of lift are from 1/16 rod and 1/8x40th strip, the support arms at the side of each lift are 3/32 tube, at the rear of each base was added handrails again in 3/32 tube. The barrel was made by a local woodturner as before in two pieces,the front piece had nothing to add and so was put away until the end.The main part had large discs glued to either side of the trunnion openings with 60th card running from these forwards and backwards at top and bottom,various strips for collars were added and from these small wedges of card all around. 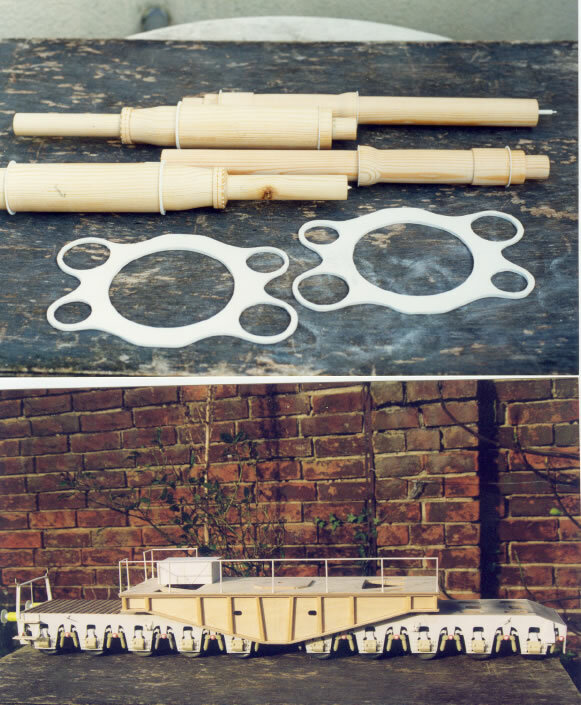 Four compensator tubes had also been turned up in wood and were.fitted two above and two below onto two 1/8 thick card bulkheads, all the smaller details were added and 24 resin bolts fitted around the pin openings fixed in place,the breechblock was then glued to the barrel end. The final jobs to do was all those bits that get left because “I’ll do them later” this included the ladders, two small platforms at the front, and other details and probably a few still missed. 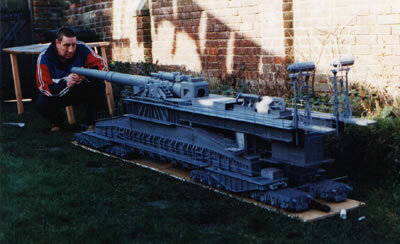 As this model was started in May 1999, it was mid January 2000 when I got round to painting it which was done using car spray grey primer,this was then airbrushed with various shades of Humbrol paint,also because of the time of year I had to wait to get the best I could for some photos,the finished pictures of the model show the bulk of it assembled, but not with all the smaller details simply because the weather did not allow. I would like to thank a few people for help with this nightmare!! !